So, he tried like thousands of other customers to rebook his flight. “I tried to reach Delta. The lines were jammed,” he said. In the Fox 5 newsroom we were hearing about airline customers with four-and five -hour hold times. We talked with an aviation expert who says this isn’t so unusual. “When you have 10 or 12,000 people all trying to contact the airline at the same time things do break down. And there’s almost no way to get around that,” said Mike Boyd of the Boyd Group International. Tom plugged away. He said, “I logged into my Skymiles account. Tried to use the link they gave me to book another flight, and the links weren’t working.” What he did next nearly cost him more than $1,000. You see, he booked two new tickets for himself and his traveling companion, on his own, outside of that rebooking system. The good news: He got on a flight the next day, one day before the big February storm white washed Atlanta. 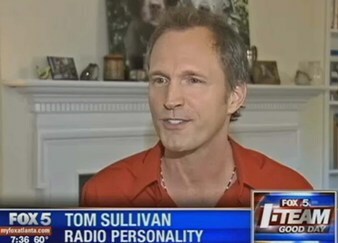 The bad news: When Tom Sullivan requested a “full refund” for the rebooked tickets Delta Airlines response was ‘no’. “When weather shuts an airport like Atlanta down, trust me, 80 percent of the passengers think it’s the airline’s fault and the airline owes me, which is not fair or accurate, but it’s reality,” Mike Boyd added. But, if you really think you’re right, this aviation consultant says you should fight. Mike Boyd said, “Don’t let up, but make sure you’re right and not just angry.” Tom Sullivan kept pushing. He wrote the CEO. And a week later, his money for the rebooked flight was finally refunded. All of it. With a big grin Tom Sullivan said, “They turned lemons into lemonade and I learned a really good lesson. Don’t book your own ticket when your flight is canceled. Sullivan said he asked an agent what he was supposed to do. He says he was told if the phones are jammed, if the Web site isn’t working, and if you want to be sure, 100 percent sure, you’ll get a free, rebooked flight, you have to go to the airport and have one of their agents book the travel for you. Still, despite the wait times and the computer issues, Mr. Boyd gives the airline an “A” grade for how it handled the situation. Delta’s spokesman wouldn’t say whether Tom Sullivan made a right or wrong choice, but he did throw into the mix two more options. Make you have the Delta app on your phone for updates and try contacting the airline through Twitter @DeltaAssist. Ever have this happen on a plane?! Century House Tavern is a Woodstock treasure!